There were two rivers that were flowing along that place where a Garuda was circling atop, it did not seem to be searching for its prey because every day at a particular time that bird circumambulates the embankment thrice and render prostrations with its beak. During the Mughal regime, Srimushnam Boovarahamurthy was appointed as a care taker for South Arcot district and Sarobhoji Rao was appointed as a Tasildhar as well. After his regular duties Sarabhoji Rao fell asleep, he had the vision of a River, Mound and the Garuda in his dream. The dream became a regular occurrence, where he was able to visualize the scenes clearly. The mound vanished and there appeared a luminance on which bloomed Lord Srinivasan and graced Sarobhoji to construct a temple for him at that place. 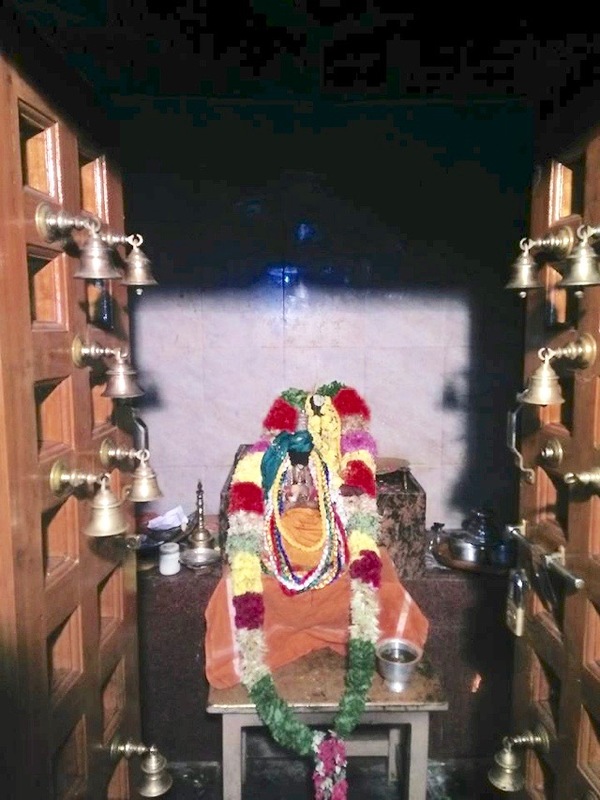 Sarobhoji abided Perumal’s ordain. When he went to that mound the next day he saw the Garuda at the mound. He cleared the mound, Lo and Behold! 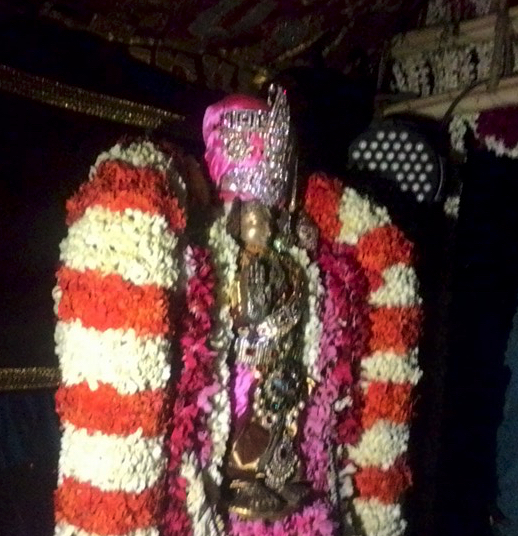 There appeared an amazing Perumal deity. He constructed a beautiful temple for Perumal and the people worshipped Him with all paraphernalia. Sarobhoji Rao immersed himself in serving Perumal. The temple that was constructed some 300 years ago, is now the Prasanna Venkatesa Perumal Koil at Padur Villupuram via Ulundurpet. Padur is situated at the south on the Holy Pancha Krishnaranya kshetram surrounded by the sacred Garuda and Sesha Rivers. The stone inscription mentions that the temple was under the administration of then king of Rashtrakutam Krishnan III during the year 964 and Perumal had been hailed and worshipped as Nagamalai Nayakanar. This place is comprised of ten villages hence it was called as pathu oor, over a period of time it became Padur. During the Rashtrakuta rule the temple was at its best, it became even greater during the Chola-s period. But during the Mughal era this temple was demolished. People safe guarded the deities by locking up in their houses, throwing some into the river. This temple has risen again due to the diligent service of Sarobhoji Rao. This temple with its huge Vimana and the tall Garuda post welcomes us. Next to that is a small stone corridor followed by a big corridor wherein there is a Bali Peeta, the Dvaja Stambha is adorned with a huge Thiruman Kappu, and the elephants guard them on either side portraying a beautiful sight. 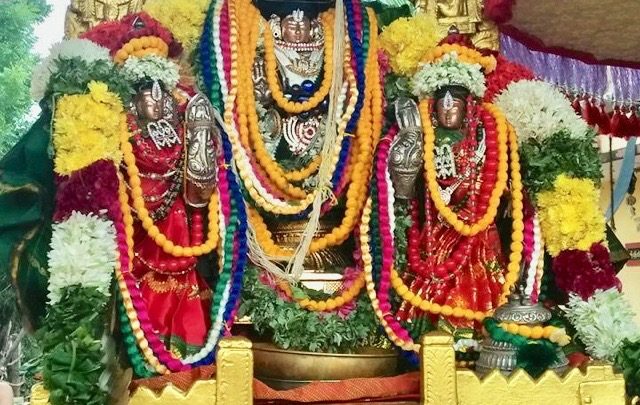 While circumambulating the temple we are tickled with a fine sensation to see the huge room filled with Perumal’s divine Sesha, Hanuman, Garuda, Vahanams. One can extend a big hand for the clean temple maintenance. There is a madapalli (temple kitchen) that prepares Amudhu for Perumal. Across the madapalli comes a sanctum with a divine vibration, which is the Jeeva Brindavanam of 36th Ahzagiya Singar Srivansatagopa Srinivasa Yatindra Mahadesikan of Ahobila Mutt. 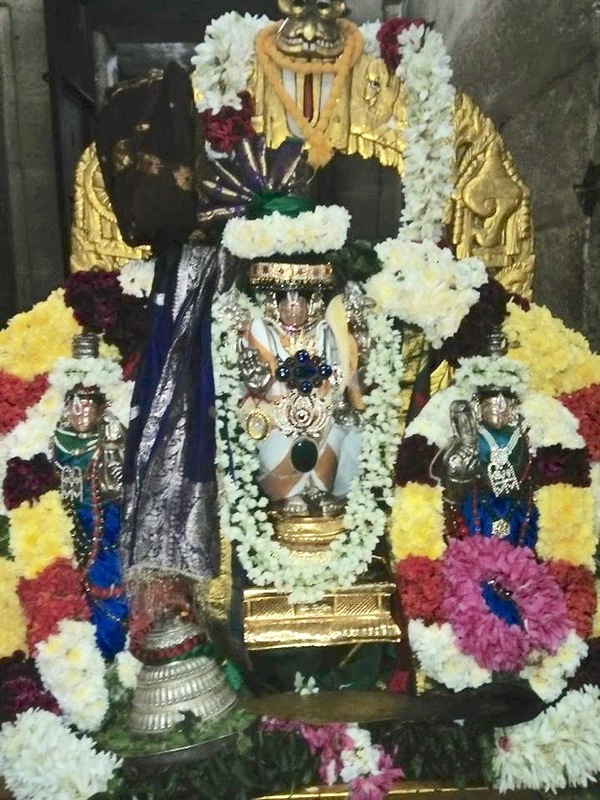 This Azhagiya Singar rendered nitya kaimkaryam to Lord Narasimha, as he could not bear to part with Lord Venkatesa Perumal of this temple, he stayed back at Padur itself and attained Venkatavan’s lotus feet at the year 1898. His brindavanam at this temple is almost 109 years old. Aradhanam is done grandly every day. This Acarya removes sorrow and grants mental peace to the devotees. Along the brindavan, the Padukas of the Acarya-s are being worshipped. Paintings of main deities from Divyadesam like Allikeni Parthasarathy, Pandarpur Vitall decorates the walls. 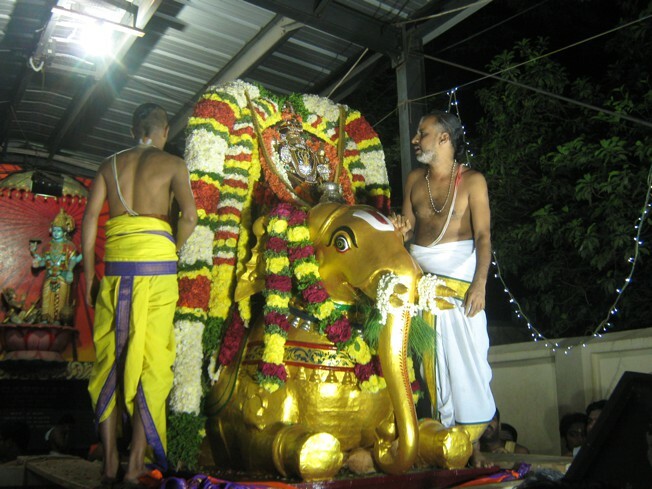 When we enter the grand mandap Garuda deity is seen worshipping Perumal with its huge flapped wings. 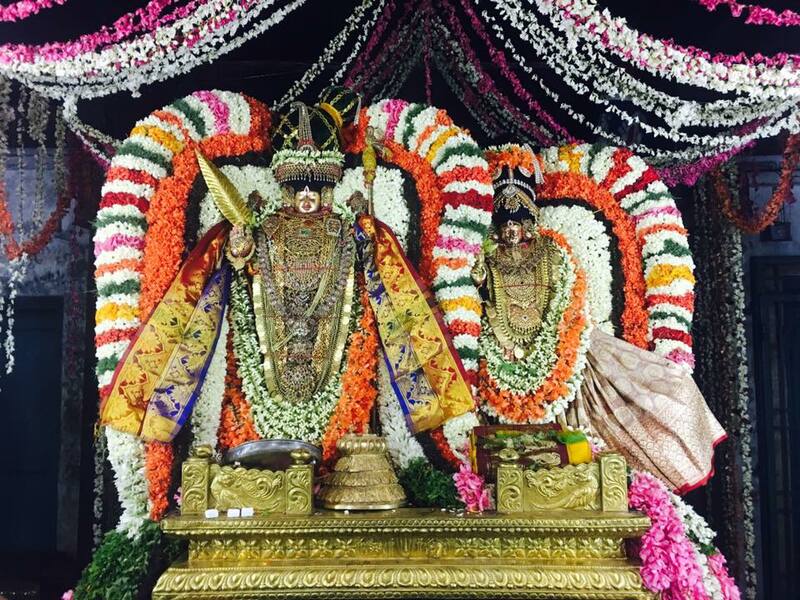 Lakshmi Narasimhar graces here, though the deity is broken yet he is beautified accordingly. 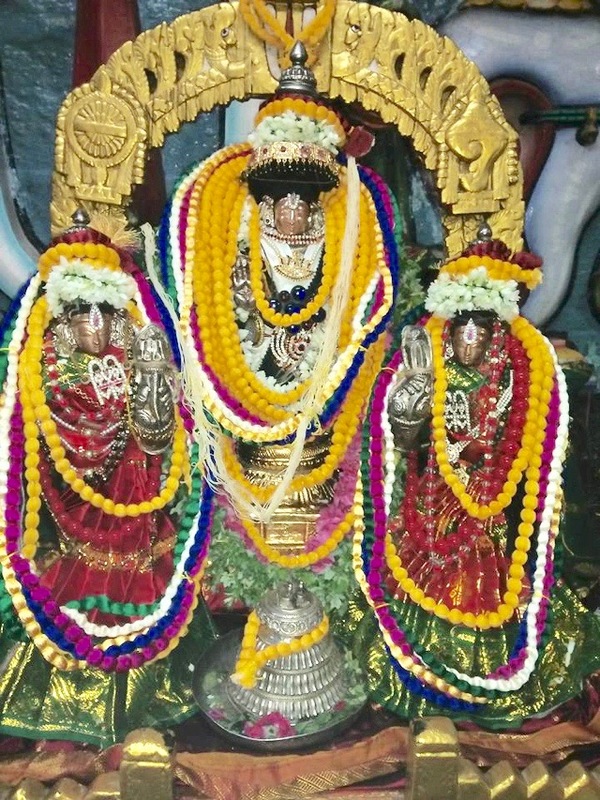 A three feet Veera Anjanayer along with Rama and Seetha graces next to this deity. The Anjaneya deity was found in a Lake of Ulundurpet and is consecrated here. The artha mandapam is graced by mesmerizing deities of Nam alvar, Andal, Visveksenar, Thirumangai Alvar, Ramanujar, Desikan and Adivan Satagopar. When we reach the Sanctum Sanctorum, Srinivasa Perumal facing east graces with his divine 1000 year old appearance. Perumal captivates the on lookers with his vardha hastam adorning the discus, conch. Sri and Bhoo Devi graces along with their compassionate glances. The consorts are consecrated newly after the Moolavar deity was discovered upon. 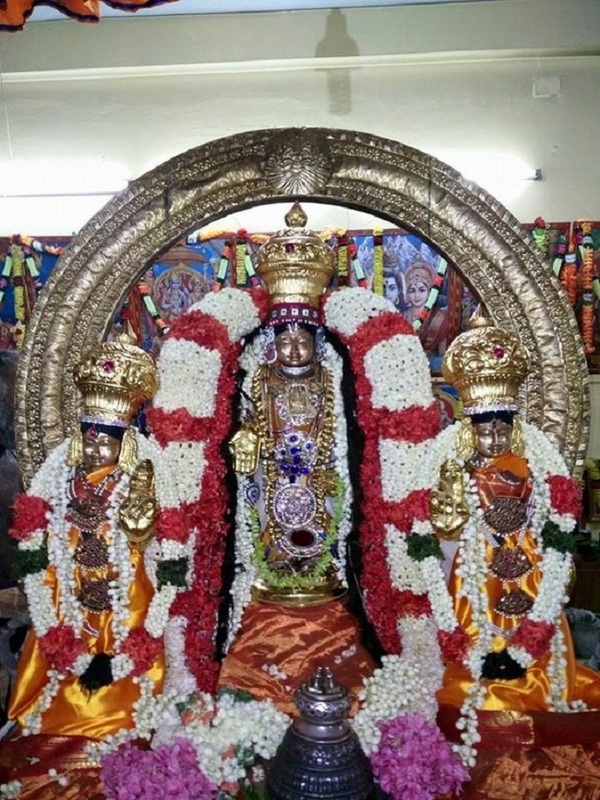 Below the Moolavar deity, appears the radiant Prassana Venkatesa Perumal Urcavar with his consorts bearing the abhaya and varadha hastam, Urcavar came from Madurai during the muslim invasion. He was found in one of the house in Padur. The presence of Navaneetha Krishna, Chakrathalvar, Selvar deities found near the Urcavar bears a soothing sight to our eyes and mind. To the right side Thayar Alarmelmanga graces in a separate sanctum. The lotus faced thayar removes our miseries with her cooling glances. Having received Perumal’s and Thayar’s mercy, we can feel Perumal’s divine grace bestowed upon us when Bhattar places the satari on our head and blesses us with Tirtham and Tulasi. Being the beloved sthalam of Thirukovilur Ulagalandha Perumal, Thalam, Thirtam and Murthy are the specialities of Padur. Pancha Parva Utsavams, Puratasi Brahmotsvam, Thiruther, Tirtavari are celebrated here grandly. 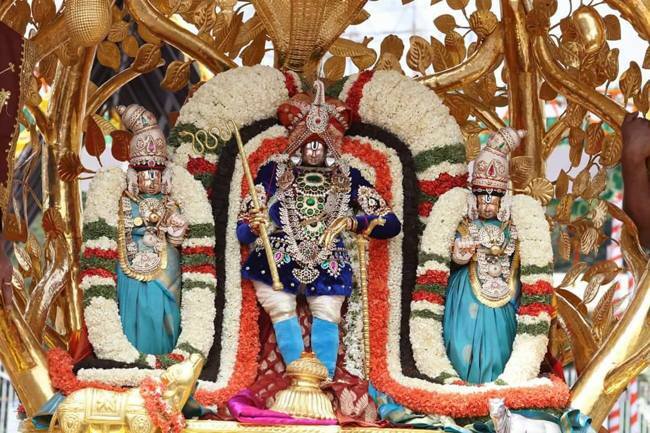 As it is a powerful Kshetram those unmarried shall get married if they participate in the kalyana utsavam. The childless shall get their wishes fulfilled by praying to the Lord of this temple assures the devotees who had their wishes granted. One can be disease and debt free if one prays, circumambulates this temple 36 times. 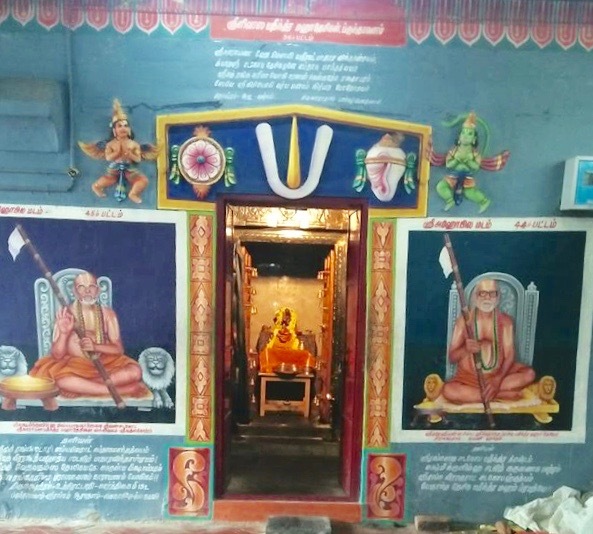 Lord Prasanna Venkatesa Perumal of this temple fulfills the devotees’ wishes. Padur divya kshetram is a serene place to visit and worship.